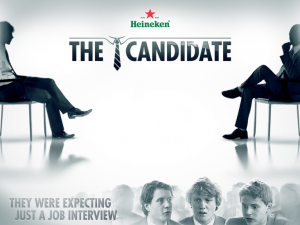 By now many of you have seen Heineken’s online video, “The Candidate” which has gone viral — over 3.425 million views to date. The video — a part HR effort, part marketing effort, shows how Heineken dealt with HR’s typical “standard questions, prepared answers” dilemma, in their European intern search. Many of us would love to have access to hidden cameras and a fleet of staff to pull off the same kind of “job interview you can’t prepare for”. But in reality, the responsibility of drawing out real answers from candidates begins and ends with the hiring manager in the interview room. One of the most common questions employers ask is: “Tell me about yourself.” The risk here is candidates may end up giving an employer too much, or too little information. Some candidates get very chatty, de-railing the interview’s focus. Others offer up only two words about themselves. To avoid this, I recommend asking the candidate: “Tell me about your ideal job.” With this question, I can still assess their work experience and their fit within a company culture without getting lost in a candidate’s personal experience. I was once asked in a job interview — “If you had $100 dollars to spend at a casino, what would you do with it?” While it may appear to be a random question, with this strategy, the employer was looking to evaluate my risk-taking abilities. Quirky questions can throw a candidate off from their pre-determined, “rehearsed” answers. You just need to ensure your offbeat question leads you to the candidate’s ideals, interests and ways of thinking. Add your own cup of creativity to dial up your questions’ quirkiness. One of the most standard interview questions is, “Tell me about your strengths and weaknesses.” Common answers are: detail-oriented, organized, and possessing good communication skills. One common weakness I often hear is: perfectionism. But what do those generic traits really tell you about the candidate? Not much! Give me an example of when you worked well as a team player. How did you use your communication skills in your previous position? Give me an example of your perfectionism in action at work. Ultimately, what we can all learn from Heineken is that, a standard interview may only give us standard candidates. Throwing candidates off in order to get them to think on their feet has proven to be the best interviewing strategy for me. The more candid the answers, the more you’ll get to know the “real” candidates beyond their interview presentation. On a side note: Heineken recently announced that they will be continuing to reach out to football fans, this time in India, to recruit a social media maven. So, it looks like there is more fun to be had!